There may only be 6 hours of daylight in Oslo at the moment, but that hasn’t stopped electric car maker Think from getting busy with spanners during the working day. 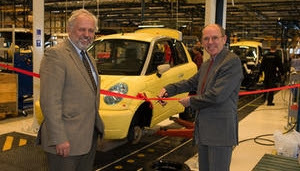 On 28 November the first production examples of the Th!nk City rolled off its assembly line. Things at Think have changed a bit since we last looked. The much-reported deal with Tesla, which in May had agreed to supply battery packs, was called off in October as Tesla refocused on coaxing its own reluctant Roadster out of the prototype phase. Instead Think will get its advanced lithium-ion guts from Florida-based EnerDel. The company makes much of the fact that Porsche has helped set up the production processes, but we doubt that means the Th!nk will be quite as quick as a Stuttgart’s finest. The City is a lot prettier than a Cayenne, however. The first production models will be used for shakedown purposes, with customer deliveries starting in earnest in the new year. No word yet on when the little tykes will be coming to the UK. Soon, no doubt.